With telematics subscriptions projected to grow to 100 million by 2018, auto insurance brands are looking to enhance their telematics value proposition, improve customer engagement and differentiate themselves from the competition in their Usage Based Insurance (UBI) programs. A few weeks ago, I wrote a post about the rise of UBI and the additional marketing and customer engagement opportunities it generates. Telematics devices, which transmit wireless and GPS tracking, produce a tremendous amount of behavioral data. But beyond lowering premiums for good driving behavior and offering generic value-add services, companies are struggling to find a meaningful, relevant use for this data. We recently conducted a study that asked insured drivers what would motivate them to participate in a telematics program, and the results might surprise you. 27.8% of respondents said they were interested in telematics in exchange for a 15% good driver discount, and 25.1% would participate in exchange for rewards points for retail gift cards, restaurants, etc. But those results nearly double, to 57.4%, when drivers are given the option of obtaining both a 15% good driver discount and rewards incentives. The takeaway? Consumers want to be recognized and rewarded for their loyalty and the money they spend with brands. They also expect leading brands to present more relevant and personalized offers in exchange for the data they provide. In fact, a LoyaltyOne study found that despite privacy concerns over sharing and contributing personal data, two-thirds of consumers would provide more information in return for relevance. By adding a loyalty or rewards component to your telematics program, you can meet the extensive wants and needs of customers, improve customer insights, alter and deepen the customer relationship and transform data to attract and retain high-valued drivers. Click the image to view the full-sized infographic. 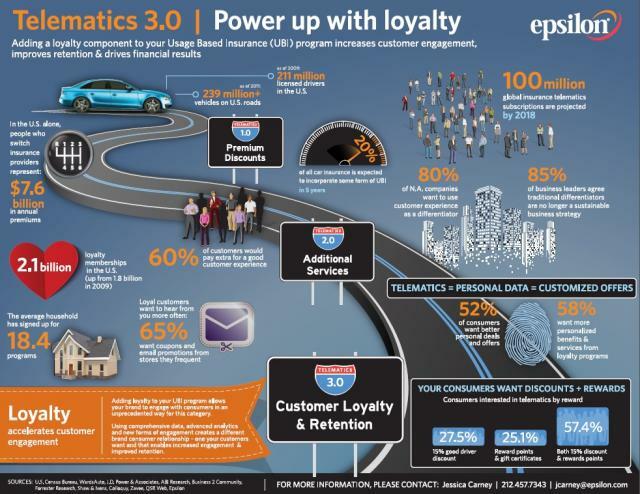 How do you envision a loyalty component enhancing your telematics program? Comment and tell us below.